Lambert Hanmer was born on the 21st October 1868. He was one of five children of Rear-Admiral John Graham Job Hanmer, and Mary Caroline, daughter of Reverend John Cobbold Aldrich, Incumbent of St Lawrence, Ipswich. He had three elder sisters: Alice, Helen and Charlotte, and one younger brother: Thomas. He left the school in December 1885 and began a career in the army. He attended RMA Sandhurst from December 1887, and went on to join the West Riding Regiment as 2nd Lieutenant in March 1889. 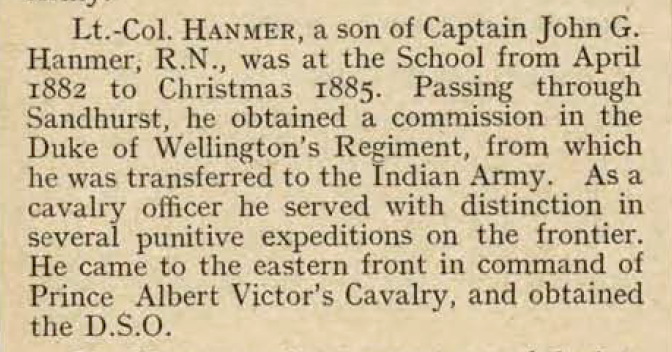 He rose to Lieutenant with the Indian Staff Corps on the 29th October 1890. Four years later, he became Squadron Officer and Adjutant with the 1st Punjab Cavalry. He saw served in the Waziristan expedition in 1894-5, and on the North-West Frontier in 1897-8. He rose to Captain in March 1900. He served as Aide de Camp between January 1900 and October 1901. On the 17th December 1901, Lambert married Ethel Elizabeth, youngest daughter of Colonel Thomas Heaton Lovett, Belmont, Shropshire. They had two children: Rosemary Elizabeth (born 6th January 1905), and Richard Graham Hanmer (born 5th November 1906). In April 1905, Lambert joined the 21st Prince Albert Victor’s Own Cavalry as Squadron-Commander, and was promoted to Major by March 1907. He became Lieutenant-Colonel on the 23rd March 1915 and was awarded the DSO on the 7th February 1918. This entry was posted in The Fallen and tagged Indian Staff Corps, Mesopotamia, Sandhurst, The Glee Society, West Riding Regiment. Bookmark the permalink.